It was just six days before Christmas at Gatwick Airport in the UK and all was not well with the passengers on board planes headed for distant lands. Unidentified drones had taken to the skies above, 140,000 passengers would have their flights delayed or cancelled, and traversing the friendly skies would never be the same again. 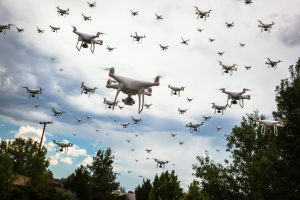 In truth, even though it wasn’t as dramatic as that, the incident may have sparked a series of drone regulations that would help the air industry in the long term. Will Regulations Make it Easier to Deal with Drone Threat? In the wake of the Gatwick and Heathrow incidents, stringent drone regulations that introduced last July got another look. While previous legislation outlawed flying drones over heights of 122m and within a 1km proximity of airports, new regulations make it illegal to fly drones within a 5km of airfields. Also included in the stricter legislature are prison sentences of up to five years and fines of up to £2,500 for those who breach the 122m height restriction. In the US, President Trump approved legislature providing Federal Security agents greater freedom to neutralize drones posing a security risk. Additional regulations are slated to be placed on drone deliveries, amateur operators, and “no-go” zones such as airports and high security areas. In the meantime India implemented its own drone policy on December 1st, 2018. Operators are now required to apply for permits for small-sized, police, and military drones while a number of others operated by State security services will need an online license. Drones flights will be permitted only in daytime and operators will have to maintain a visual line of sight with their device. High-security areas such as airports, international borders, Vijay Chowk, State Secretariat Complexes, and key military installations have been designated as “No Drone” zones. Eco-sensitive areas have also been restricted for drone flights. In addition, drone launches from moving vehicles and aircraft are prohibited. The new rules are likely to help Law Enforcement units deal more effectively with the drone threat. The “Laser Burner,” a futuristic-looking anti-drone gun that allows military personnel to jam a drone’s connection to its operator, is currently used by a number of armies worldwide including the US Armed Forces. The advantage of this device is that it allows enemy drones to be liquidated using three core methods: foot units, stationary bases, and vehicles. While amateur drones might be brought down in rare cases of false alarms, the Laser Burner is the best option currently available for ensuring enemy drones capable inflicting serious damage to sensitive locations, military personnel, do not succeed in mounting large-scale attacks.